Commercial real estate is an investment in your business. Naturally, you want to find the best location for your target clientele at a rate that makes sense for your budget. The perfect location will help your business grow and attract other business or foot traffic who need what you have to offer. Working with a talented and licensed Commercial Broker ensures you’ll find the ideal property for your business. Just as when you’re looking for a lawyer, dentist, or doctor, you need to feel comfortable with your choice so a fair amount of instinct and common sense applies. In addition, there are some specific things you should look for. Some brokers focus primarily on housing. While they’re talented in that area, they don’t have the expertise to assist you with commercial property. Be sure you work with a real estate broker who knows about office, retail, and other commercial spaces. Some commercial brokers have more experience working with landlords, others working with tenants. Assuming you’re not planning to rent out your commercial space, look for a commercial broker who’s got experience working with tenants. Get references. Look around the target area for well-established business that is similar to yours. Talk with the owners about who their broker was and who they recommend. Years in business. The longer a commercial broker is in business in the area, the great their knowledge of the area is. Look for a commercial broker who has the financial footing and area knowledge to get you the best deal possible. Once you have a short list of brokers, interview your top choices to select the one who best suits your needs and business. Ask about their experience. Your research should already show this but ask them anyway. You want to hear their own words and level of confidence in their abilities. What size is the office? If you’re a small or medium-size business, you may get lost in the shuffle in a huge real estate office. How are they compensated? Many commercial brokers are straight commission. This can put pressure on them to find higher priced spaces and close deals quickly. Some offices offer small salaries to their commercial brokers, reducing this pressure. Once you’ve chosen the right commercial broker for your needs, review and sign a contract to get started. At Applegate Commercial, our brokers have the skills and expertise to help you find the best space for your business. 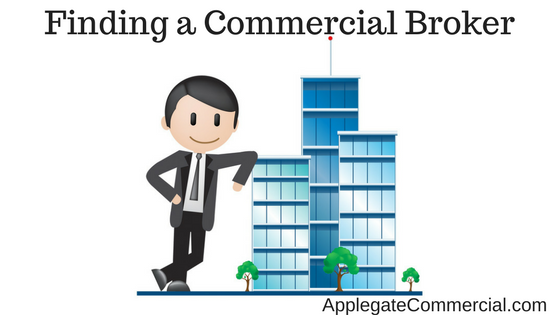 Contact Applegate Commercial Brokers today to learn more.